The following was published by the Ballyhea/Charleville Says NO! group, a .PDF copy of this document can be downloaded here. To the EU: Through the ESM, restore to the Irish Exchequer a) the €3.1bn already destroyed on the basis of those Promissory Notes, b) the €20.7bn taken from our National Pension Reserve Fund to bail out those banks and c) the remaining €12.2bn or so borrowed from the various emergency funds to bail out the Irish banks. The first proposal will ease the long-term bank-debt burden, the second will ease the current situation, give us money to invest in job-creation and thus enable us grow our way out of this recession. To discuss these proposals we are looking for a meeting with the ECB (in the case of the first proposal) and the EU (in the case of the second). As we take this fight to Europe we are calling for the backing of every TD and Senator, of every Council and Corporation, of every MEP, and especially of our President himself; we are also asking for the backing of every union, of IBEC, the various Chambers of Commerce and ISME, of every sporting organisation, of every national organisation great and small. We would appreciate especially the support of our media, all forms local and national. Dr Constantin Gurdgiev, UCD & TCD; Seamus Coffey, UCC; Jagdip Singh (Namawinelake). an absence of any structure in the event of emergency. Within eight years the Euro crashed, taking with it a whole array of banks and causing devastation in the economies of several Eurozone countries. One of the major causes of the systemic imbalances built up over 2000-2007 period across the Eurozone was the monetary policy mismatch (summary here by Dr Constantin Gurdgiev). Those of us in what is now known as the Eurozone who signed up to the new currency and all its myriad design flaws share responsibility for the chaos it has caused. We must also share the cost, the various financial institutions who engaged in the reckless lending especially so. In Ireland, we have been burdened with a massively disproportionate share of that cost. How much? Up to the IBRC wind-up, according to the respected Namawinelake blog the Irish bank bailout amounts to €69,700,000,000. That’s approximately €15,213 per person, over €60,000 for the average Irish family. When the crisis hit Europe, Ireland was first in the firing line. Lacking any guidelines or structures from Europe, or any supervisory oversight, the then Irish government took unilateral action to save its banking system, the infamous ‘blanket bank guarantee’ of September 2008. It was ill-advised in every sense but all of that advice – and the subsequent decision – hinged on the misinformation given by the banks themselves that theirs was merely a temporary problem of liquidity, when in fact several were already insolvent (see page iii section ‘Consensus’ for the role international and EU institutions played in driving unsustainable risk build-up in Ireland). The Guarantee was issued in the environment where any real advice or direction from either the ECB or the EU was lacking, with Irish authorities left on their own to deal with the acute crisis. Regardless of the problems emanating from that guarantee, however, and the EU’s negative response to it, from the outset of the crisis the stated policy of the EU/ECB itself was to bail out every bank and every bondholder – there would be no ‘haircuts’, no ‘burden-sharing’. And so it was that as the years passed, as more and more austerity has been piled on the Irish people, bond after failed bond in bank after failed bank in the Irish system was paid in full. That policy flies in the face of all natural justice, has resulted in a situation where the poorest in society are subsidising the richest, bailout of the rich by the poor. This policy also contradicts EU responses adopted in subsequent bailout packages in Greece and Cyprus. With that in mind, we are now taking our case directly to Europe. IRELAND SAYS NO (15 weeks). Our campaign began on March 6th 2011, the weekend after the last General Election when Enda Kenny, even before he had met with Eamon Gilmore to form the new government, announced that burden-sharing with the banks wasn’t going to happen. Apart from the weekly march, in the past 115 weeks we’ve been to the Dáil thrice, to Brussels twice, to the ECB HQ in Frankfurt once, all at our own expense. We are individual citizens exercising our civic right, our civic duty, to fight for our families, our communities, our country. This massive debt has been imposed on us without consultation with us, without anyone even asking for our approval. We repudiate that debt. We hear of all the Irish/EU/ECB rules/regulations/laws protecting the banks/bondholders/financial institutions; where are the rules and regulations and laws protecting the people? 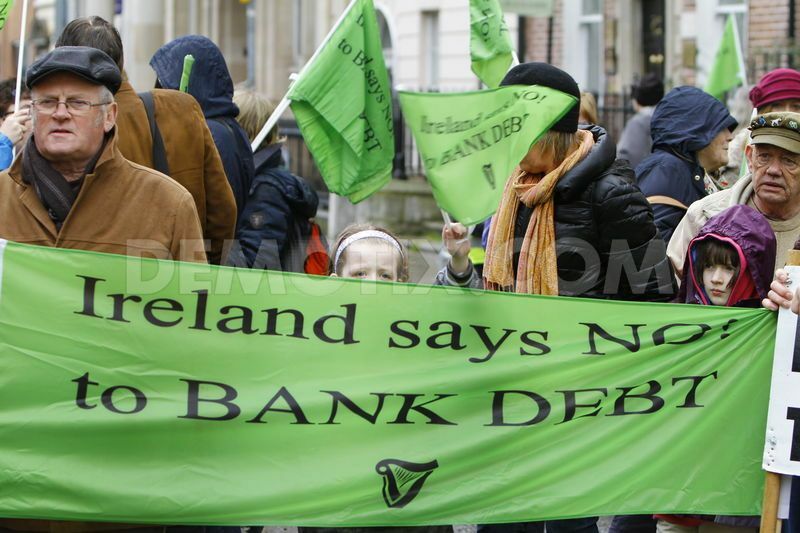 How did we end up with a bank-debt of €69.7bn imposed on us? Individually we all have our different political beliefs (or none! ); collectively we are a-political. We are not economic experts and don’t pretend to be; in gender, age-group and employment status we’re just a cross-section of Irish society, with a single, united agenda – lift this unjust bank-debt burden from our shoulders. We won’t rest til it’s done.